President Trump will keep Deferred Action for Childhood Arrivals intact. WASHINGTON — The Trump administration is leaving in place a program protecting hundreds of thousands young immigrants from deportation — one that President Donald Trump had pledged to eliminate. Homeland Security Secretary John Kelly quietly announced the decision at the bottom of a fact sheet released late Thursday declaring the end to a similar, but never-implemented program intended to shield immigrant parents of U.S. citizens and legal residents from deportation. As a candidate, Trump pledged to “immediately terminate President Obama’s two illegal executive amnesties.” Yet as president, he repeatedly expressed empathy with the young participants in the program known as Deferred Action for Childhood Arrivals program, or DACA. Many participants, often referred to as “dreamers,” arrived in the United States as small children and have little recollection of their birth countries. The program was launched in 2012 and has protected about 787,000 young immigrants from deportation. The program does not give them residency status, but temporarily protects them from deportation and allows them to work legally. The protection can be revoked at any time and some young immigrants have lost their DACA protections after being arrested for a crime. The program affecting parents, Deferred Action for Parents of Americans, or DAPA, was blocked by a federal judge in Texas after 26 states sued. Republicans saw it as a “backdoor amnesty” and argued that Obama overstepped his authority by protecting a specific class of immigrants living in the United States illegally. That program, like the one for young immigrants, was created with a policy memo, not by legislation. Both programs required that participants meet certain conditions, including not having a history of serious crimes. 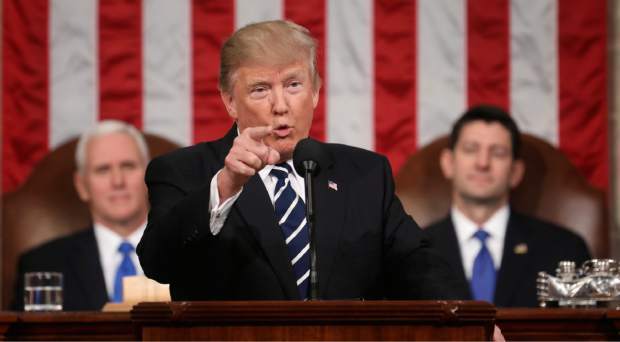 Trump has made immigration enforcement a top priority and has vowed to continue a crackdown on those living in the U.S. illegally and those trying to sneak into the country. Arrests of immigrants inside the U.S. have increased under the Trump administration, but deportations are slightly down as fewer people have been caught crossing the Mexican border into the United States illegally.